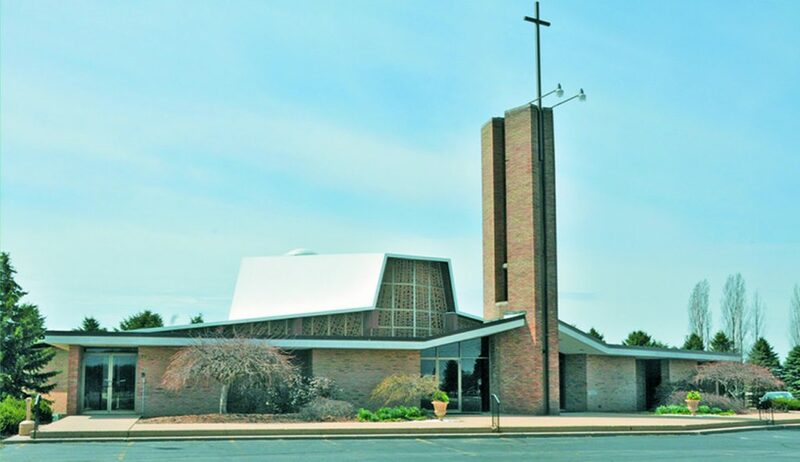 On July 1, 2014, St. Anne (Linwood), Sacred Heart (Kawkawlin) and St. Valentine (Beaver) merged to form a new parish, Prince of Peace Parish. Sacred Heart will serve as an additional church and have a weekend Mass. The parish is consecrated to the Sacred Heart of Jesus, a devotion that emphasizes the unending love, compassion and long-suffering heart of Christ for humanity. Feast day: Celebrated 19 days after Pentecost and always falls on a Friday. French missionaries arrived in 1891 to minister to French-speaking families. It took years of hard work for the first church to be completed but, in 1899 the church was destroyed by fire. Mission church supervision moved between four parishes until 1911 when a permanent pastor was assigned. Father William J. Walsh became Sacred Heart’s second pastor in 1957 and Father Chester Pilarski became the third pastor and the master planner of its present campus. Construction of the present church, noted for its white vinyl roof, began in 1970 and its design brought the congregation closer to the altar. The interior illuminated by free-form colored class blocks and has no windows. A garden and statue of the Sacred Heart are recent additions to the grounds.